One of the presents for dogs is the ability to go in and out whenever they want. Dogs have to go to the bathroom at various times the day, just like people do, and it is not always convenient for you to get up and let them out – not to mention wait for them to be done so that they can come back in. An electronic dog door gives your pet the freedom to go in and out whenever they like, and absolves you of the responsibility of getting up in the middle of the night. It also prevents accidents from dogs that have a hard time holding it. But how do you choose the right electronic dog door? Let’s take a look at the top five electronic dog doors. These are terrific, top-of-the-line dog doors that all work with the latest electronic technology to allow your dog access to the outside and the ability to come in as well; without any of the problems that come from a simple dog door that can be accessed with pressure. These are all great choices. The first is this high-tech dog door that works with ultrasonic technology. There are two different sizes that you can get with this particular door, medium and large, but they work with dogs that are one size down. In other words, for the medium-sized door, you want to install it for smaller breeds like Yorkshire Terriers and Poodles. The large-size door might be appropriate for German Shepherds or Boxers. However, some of the larger breeds might struggle with this door so you may want to consider going with a different pet door. If you do have a pet that fits, this one is pretty amazing. It works with ultrasonic technology that activates when your dog approaches it. It is much like the sliding glass doors that open up at the grocery store for you. However, instead of opening horizontally, this pet door opens vertically. It starts opening when your pet is a few inches away and is completely open by the time they reach it and will close just seconds after they exit. They can come in and out as they please, and the door has a really smooth motion that does not get stuck and will only open for your dog’s ultrasonic devices attached to their collar. Some of the other features of this electronic dog door include a motor driven vertically sliding door that is activated by the MS-4 ultrasonic collar. It works on direct approach principle, which means that unless your dog is actually moving towards the door and intending to go out, it will not open. If they just pass by the door, and are not pointed in that direction, the door will almost never open. In addition, this electronic pet door has four different settings that you can choose from. You can have it totally open for your pets to go in and out, you can allow them to go out only, you can allow them to come back in only or you can lock the door down completely so that they cannot leave the house or come back in. This makes it very versatile and useful for all kinds of situations. Second on the list is this PetSafe electronic pet door which is one of the budget models that we’re going to feature here. Not everyone can afford the electronic pet doors that are listed here, but this one comes in at a price that fits almost any budget. It also has many of the advantages that you’ll find with electronic pet doors. For example, you are able to maintain insulation even though there are no electronic components, thanks to the dual flap and telescoping tunnel system that make up this design. There are three sizes available with this pet door, small, medium and large. However, you may struggle with large breeds like great Danes, or even with Huskies, Labrador Retrievers or Golden Retrievers. French Bulldogs and Beagles should be fine as the largest size supports pets 75-100 pounds or so. There are two other sizes as well, the smaller of which should be used for tiny dogs and the next size up for small to medium. This pet door does have a panel that you can slide in to prevent your pet from accessing the door and to protect your home from losing heat or cool air through the dog door. This is not the most convenient thing in the world, but it is effective. Some of the other advantages of this particular pet door include the fact that it is really easy to install, and it takes a lot less work than a standard electronic door to place it in a wall or in one of your doors. In addition, it has a dual flap system which helps to retain the heat or cool inside your house even if you do not put in the sliding panel. The bottom line is that this is a budget option that doesn’t have the advantages that the other electronic pet doors do, but it is affordable and functions very well. This door is not nearly as efficient at maintaining the environment, and it could allow animals other than your own pets in if you leave it open without the sliding panel, but it works really well for a budget option. 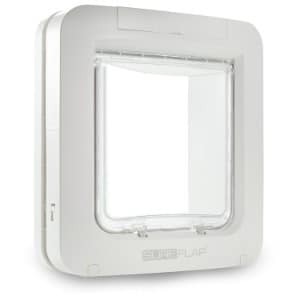 Another terrific model is this SureFlap microchip electronic pet door. This door has a marked advantage over all of the other doors on this list. It works with your pets existing microchip. If your dog was a rescue, or if you went to the vet and had a microchip installed yourself, then you do not have to worry about attaching anything to their collar or purchasing any additional technology for this door. With the ease and availability of micro-chipping these days, every pet should have a microchip, and all you have to do is program your electronic pet door to accept your pet’s unique microchip signature and they will be able to access the door whenever they want to go in and out. This is a major advantage because electronic pet doors that are not keyed to your pets individual signature can allow other animals in, including other dogs. This can be a problem if you have a female and she is in heat. Many a dog owner has come home when their female dogs in heat and found a male dog sniffing around the yard. Sometimes, they can get in through unsecured dog doors, but since this will not open for just any dog; that will not happen. Something else that you will love about this door is that even if your dog does not have microchip, it does come with an RFID tag that you can attach to your dog’s collar. That means if your dog is not microchipped, you don’t have to spend any extra money to get the door to work. Finally, you can program the door so that only opens during specific times of the day. This is called a curfew mode, and it is a good idea for pet owners that do not want to allow their pets out during certain hours regularly. Of course, it can also be used to prevent pets from going out temporarily as well. This electronic dog door does require 4 C batteries, but since it is so efficient, you shouldn’t have to change them for around a year. This Solo automatic pet door is one of the best pet doors on the market and it is unique even among the best of the best that are reviewed here. One of the things that make this the most versatile pet door on this list is the fact that it comes in 10 different sizes. That means that no matter what size your dog is, you are going to be able to find one that fits them perfectly. Getting the right size accessory for your dog is important, whether you are talking about a dog playpen, dog house, dog bed, outdoor dog kennel, dog collar or even a dog harness. 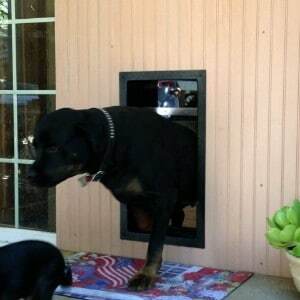 The fact that you can custom fit this dog door to your dog’s particular size is extremely useful. However, there are other advantages as well. For one thing, the stores completely automatic and utilizes a magnetic entry system with one free magnetic transmitter already included. You can get additional ones that are sold separately if you have multiple dogs. The benefit of the magnetic entry system is that there are no electronics so there are no batteries that you have to replace. This not only makes installation easier, it also makes replacing batteries that drain quickly a nonissue. Another thing that makes this particular door unique is that it was made to install easily no matter where you are going to install it. There are two different builds depending upon whether you are going to install it into a wall or into a door. A lot of the other dog doors on the market say that they are able to be installed in both locations, but they are usually fitted for one of the other end it is a pain to install them anywhere else. This dog door makes installation a lot easier. With all of the advantages offered, the only thing that could make this better is if there was a second dog collar attachment offered. However, they aren’t that expensive unless you have half a dozen dogs or so. The PetSafe electronic SmartDoor is the second PetSafe product on the list and while this is a decent pet door, there are a couple of things that you want to keep in mind about it. The first thing you should understand is that this is the budget door on our list. This door is well within anyone’s budget, depending upon which model you get, and it works with a smart key that you attach to your dog, opening up when they approach it. You should also know that it comes in several different forms including a large size and a small size, as well as a model with the battery included and a model with an extra smart key. The good thing about this model is that it comes in at well under budget for an electronic smart door, and it is extremely easy to install. You can also choose the wall install kit if you plan to install it anywhere other than in one of your existing doors. However, you do want to keep in mind that you might want to choose a different model if you live in an extremely cold environment. Many users have reported that extreme cold makes the door slow down or freeze up, but for anything other than extreme cold, the door should work perfectly. However, there are advantages as well; for example this door is programmable for up to five different smart keys. That means that if you have dogs and cats, up to five of them can use the same door to get in and out without allowing other animals in. In addition, it takes 4 D batteries which last for a very long time; even if you have multiple pets. The bottom line is that even though this is a budget option, there are still some really great things about it that you will like the make it unique among other doors on this list. Knowing what you need to consider before buying a dog door is important. There are a lot of things to keep in mind when it comes to buying an electronic dog door. There are a lot of factors that go into it. You have to worry about installation, as well as getting the right size for your dog. Some dog doors are labeled as large, giving the impression that they are intended for large dogs, when actually they won’t fit anything over 100 pounds. You have to become informed on the electronic dog door market if you want to get the perfect door for your dog. Of course there are other considerations as well; including what type of technology is used to open the door. You want to allow your dog to get in and out when they want to, but you also want some level of control, and you especially want security to keep other animals from getting in. These are all things that we will be covering in this buying guide. This buying guide will be able to show you everything that you need to know when it comes to buying a dog door, and help you with all of the various factors that you need to weigh. Just like cooling pads for dogs, cooling vests for dogs or a dog ramp for older or disabled dogs, you want something that fit your dog perfectly, almost as if it were made for him or her. Let’s look at all the factors that you need to consider. There are definitely some benefits to electronic dog doors. Just like a GPS tracker for dogs and dog activity monitors allow you to keep tabs on how much your dog is exercising, electronic dog doors are useful tool to make sure your dog is healthy as well. If you have a fenced in yard, you don’t have to take your dog out for a walk with the pooper scooper and poop bag in hand to allow your dog to go to the bathroom. They can choose when to go out and use the bathroom in the yard, and you can give them their own space that they can play in as well. One of the major benefits is that you provide major comfort and convenience for your dog. Even if your dog is trained to go to the bathroom at certain times of the day, that doesn’t necessarily mean that their body is always going to cooperate; being able to go to the bathroom when they need to go, especially when you are out of the house, at work or sleeping at night, can be extremely beneficial to the bond that you form with your pet. Can you imagine having to go to the bathroom very badly and then having to hold it for several hours? Another thing that happens when you give your dog their own electronic dog door is that they are able to spend more time outside playing in the yard. A smart dog door allows them to go out whenever they like and run around the yard, burning pent-up energy, and increasing their heart rate and blood pressure which makes for a much healthier pup. A dog door with collar lets them go out when they want and come in when they want, ensuring that they do not have to spend too much time outside of when it is too hot and that they can spend less time crashing through the house and knocking over your stuff. Also, being able to go outside can relieve anxiety. Some dogs have anxiety when their owners are away, and they end up chewing something inside the house like your shoes or a roll of toilet paper because they are bored and anxious. Being able to go outside and see other people or different scenery will prevent boredom and anxiety to a large degree. Finally, getting a doggy door actually allows your door to last longer. Dogs often scratch at the door when they want to go out or come in, and this can cause wear and tear on your door, rip your screen up sometimes, and put undue pressure on it that will wear out the lock as well as the doorjamb. To understand electronic dog doors, you first have to understand the mechanism by which they work. There are five main ways that electronic dog doors operate. The goal of each of these methods is to allow your dog to get access to go out and play with automatic fetch machines or other toys without any other animals having access. That goes for all of your other pets that you want to get in and out as well of course. Each of these methods is a little bit different, and each one has their own advantages and disadvantages. Let’s look at each of the mechanisms and operating principles of electronic pet doors in detail below. Microchip: Microchips are one of the best ways that a smart doggy door operates. You may have heard of micro-chipping before when it comes to pets. That’s because when you go to the animal shelter and rescue a dog or cat, they will often ask you if you want to pay extra for micro-chipping. In fact, some animal shelters already provide micro-chipping as a matter of course. This allows you to track your pet down if he or she gets lost, as well as allowing people to notify you if they happen to find your dog or if he or she gets hurt. Electronic dog doors can be made to you work with existing microchips so that you do not need anything extra to trigger them. Magnetic: Another method is with magnets. Magnetic doggy doors are doors that are based upon a couple of different principles of magnetism. In the first, there is a magnet on your dog’s collar the pulls a lever when they approached the door releasing the mechanism to open it. In the second principle, the dog door detects the magnetic field that is being generated by the dog collar and opens. In either case, the motion is smooth and since magnets do not have a power source, you do not have to change batteries or worry about your dog not being able to get out because the batteries are dead. RFID: RFID is another method of controlling dog doors. RFID stands for radio frequency identification. RFID is how animals are tagged in the wild. 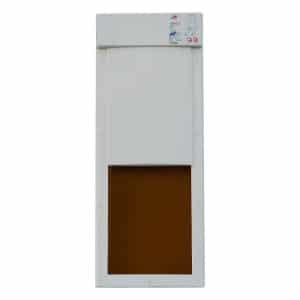 RFID and magnetic dog doors are very similar in the way that they function. The RFID device senses the presence of another RFID embedded device within a specific electromagnetic field. The tags contain information and if that information matches the other device, then the door opens. It is a really great system because it virtually eliminates the chance of a false positive and another animal getting in. However, RFID tags are the most expensive. Ultrasonic Waves: Your electronic pet door might also use ultrasonic waves. Ultrasonic waves are high-frequency sound waves that communicate with sensors on the dog door. The main advantage of using this particular method is that you’re able to adjust the sensitivity yourself, so you can decide how close your dog needs to get in order to open the door. In addition, ultrasonic waves can be directed, so if your dog is not actually heading for the door with the intention of going out, then the door will probably not open. Radiofrequency Chips: Finally, radiofrequency chips are the more basic form of RFID. They work on radio frequencies and open the doors based upon those frequencies. However, there is no information embedded into the signal that tells the door whether or not it is okay to open it. That means that if another dog wearing a radiofrequency chip were to approach the door, it would open for him or her just as if it would open for your own pet. Choosing the right size is also extremely important when you’re shopping for dog doors. What you have to keep in mind is that the size of the dog door does not necessarily correspond to the size of your dog. For example, a medium door may not fit all medium-size dogs. The thing that you want to look for is the weight that is listed. But even then, you may have to go a little conservative. That’s why the most failsafe method for determining whether or not a dog doors going to fit your dog is by measuring. Let’s start with measuring your dog. The tallest point of your dog is going to be the top of their head, but they can duck it down to a certain extend to get through a dog door. However, you shouldn’t measure any lower than the top of their shoulders. If they can keep their head level with their shoulders and back while walking through the doggy door, then they will be able to fit through comfortably. You also want to measure width. Choose the widest point of your dog, which may be right in the center of their belly, and determine how many inches they will need to get through a dog door. From there you have a few things to keep in mind. First of all, the height of the passageway should be two inches higher and two inches wider than your dog. So if your dog measures14 inches high, then you want a dog door that is at least 16 inches. Remember not to measure from the bottom of your whole house door, but measure from the bottom of the dog door because there may be a couple inches difference if there is a lip that they need to step up on top of. Another thing you want to keep in mind is whether your puppy is still growing and could gain a few inches in height as they get older, or whether your dog might have the propensity to become obese and have a hard time fitting through your dog door. Electronic dog doors are fairly expensive, and you only want to install one single time. That means that you want to allow little extra room if you have the habit of feeding your dog is much as he or she wants to eat, or if you expect your dog to grow a few inches in the next few weeks or months. Finally, keep in mind that if you have flaps to prevent your heat or air from getting out, they can cause your dog anxiety if the space is pretty small. 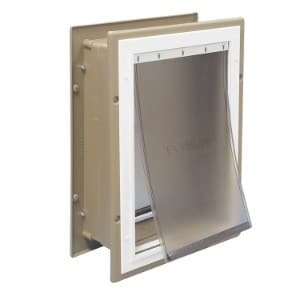 That’s why you may want to allow another couple extra inches if your electronic dog door uses a tunnel with plastic flaps that they need to walk through, or if the dog door opens or closes fairly quickly. You don’t want to cause your dog anxiety while they are using your doggy door. Knowing where to install your electronic dog door is important. When it comes to an automatic doggy door, you have pretty much two standard choices. You can either install your pet door in one of your regular doors, which is the most common practice, or you can install it in a wall. There are advantages and disadvantages to both. If you decide to install it in a door, then you don’t have to worry about electrical wiring or anything else in the wall and it is going to be a lot easier to install. In addition, your dog is going to be going out the same door that you do, which likely leads directly to either the front yard of the backyard. On the other hand, installing your door inside of the wall might take a little more work, but if you do not have a door that leads directly into a fenced in yard, it might be your only option. Just make sure that you get the installation kit that is intended for a wall instead of for a door, because they can be quite different. The materials that your dog doors constructed out of are also worth noting. Generally, there are two different materials that you will be choosing from. There are plastic frames and then there metal frames. This is pretty simple to figure out, and it depends upon the size of your dog and how active they are. A plastic frame is usually going to be appropriate for smaller dogs or those that are less active. If you have an active dog and you get a dog door that is large enough for him to be able to pass through easily without brushing up against the sides, then plastic may be appropriate. On the other hand, metal dog doors are much more able to stand up to abuse. Of course the disadvantage with metal dog doors is that they cost more than their plastic counterparts. Energy efficiency is also an important thing to consider. The nice thing about dog doors is that they provide more energy efficiency than standard dog doors. That’s the reason the standard dog doors have flaps. They are intended to keep your cool air or hot air in depending upon the season, and to disallow the opposite temperature air from getting in from the outside. 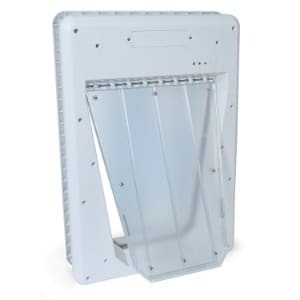 The nice thing about electronic dog door says that they provide more energy efficiency than standard dog doors because they close tightly when they are not in use. Just make sure that whatever electronic dog door you get seals up when it closes and that a minimum of air is able to pass through. You have a few programming options when it comes to electronic dog doors, and you will want to evaluate them carefully before you buy. There are four basic options when it comes to programming your dog doors, but they may differ from one model to another. Obviously, you can leave your dog door open at all times. That means that your dog can go in and out as they please, whenever the door is set at this particular setting. You can also close the door down completely and prevent them from going in or out. This is a good idea if you want to keep them in at night, or if you prefer that they go out into the yard for a while and play while you do something indoors that might overexcite them or give them anxiety like vacuuming. But some electronic dog doors also give you the option of restricting movement in a specific direction. For example, you can set it to allow your pets to go out, and once they go out they will have to stay out until you reset the door to allow them back in. The reverse may be true as well. You can set it to allow them to come back again if they are outside, but restrict any other pets from going out. Not every dog door has these options, but you want to look for them because they can be a really useful way to make the most of your electronic puppy door. When it comes to installation, there are definitely a few things to keep in mind. Installing a pet door isn’t that hard, and you don’t have to hire a professional, but you do need to have the right tools as well as the materials that come included with your pet door installation kit. You should also have a basic understanding of how the job needs to be accomplished. You can often find videos online that will explain to you how exactly to install your particular pet door, as well as the documentation that came with your door. Most of the products out there come with a cutting template already, but you will have to provide some kind of saw or other cutting tool yourself. Using the right tools depend upon the material of the dog door itself, as well as the material of the door or wall where you are installing it. There are a few tips do you want to keep in mind when it comes to installing and using a dog door. First, make sure that you are aware the dogs can gain and lose weight just like humans do. Do not make your dog door too restrictive. If your dog gains a few pounds, you still want them to build a fit through the dog door easily until you can get them back to their regular weight. In addition, make sure that you choose a door that cannot easily be opened by nosing or pushing through. Most of the electronic dog doors out there will prevent intruders from coming into your house, but some of them are rather flimsy and will allow the entry of other dogs – especially if your female dog is in heat – as well as foxes or other animals. Finally, make sure that the dog door that you choose has a warranty. You will not know if you are 100 percent happy with it until you have installed it completely and used it for a few days or weeks. Make sure that you can return it if you don’t like it and that if it breaks down it is covered by a good warranty. The bottom line is that there are a lot of things to keep in mind when it comes to choosing the right dog door. Your electronic dog door needs to fit your dog perfectly, and you will have to decide which of the mechanisms you like best. In addition, you want to determine whether you want a swing door, a vertical lifting door or horizontal parting door; where you install the doors also a consideration. All of these things must be evaluated in order for you to choose the right door for your pets. However, with this buying guide, you should have a major jump start on getting the right dog door.